WeTip is committed to providing the most effective, anonymous citizens crime reporting hotline system in the nation. WeTip promises and ensures absolute anonymity, not just confidentiality. WeTip provides intelligence and information to local, state, federal and international law enforcement agencies relating to criminal activity obtained from an online and telephone crime reporting hotline. You have the right to be respected and not be teased. Help Put A Stop To Crime. And Be 100% ANONYMOUS When Reporting Any Crime. NO ONE KNOWS WHO CALLED! Click Here to Submit a Tip Online Now! Become A Part Of The Solution Not The Problem. Help Make Your Neighborhood Crime-Free. Learn More About The Benefits Of Membership. Click Here to Become A Member! Get The Latest News From WeTip Nationwide Members. Read Our Anonymous Tip News Blog. Why WeTip Anonymous Crime Reporting Hotline? Because People…Everyone...Students, Employees, Citizens…Everyone Needs A Way To Safely Give Information About Something That They Know…A Crime, A Suspicion, An Incident, A Threat…Something They Suspect… Something That Scares Them…Without Fearing Someone Will Retaliate Against Them For Telling. It Is Simple, It Is Safe, It Is Totally And Absolutely Anonymous. The Wells Fargo Foundation And WeTip Join Forces To Fight Crime. Show Your Support Of WeTip With A Customized Coffee Mug Or Mouse Pad Or Even T Shirt. Show People That You're A Part Of The Solution, Not The Problem. These Customized Products Are Available To You For A Reasonable Price. Learn More About The Benefits Of Membership. 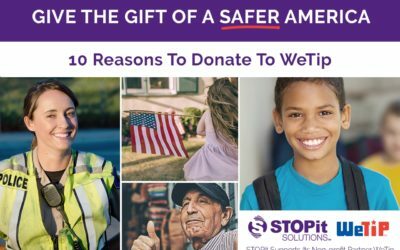 For Over 40 Years, WeTip Has Provided A Safe, Anonymous Hotline To Schools Throughout The Nation. In 2009 WeTip Added The BULLY Hotline, In 2011 We Added A Mobile Tip Form, Making WeTip Easier For Students Of All Ages To Report Crime, Especially Bullying, In Their Schools.Also Help Put A Stop To Graffiti And Other Vandalism. Call WeTip 24 Hours A Day, 365 Days A Year To Report Welfare Fraud, Cal Fresh Fraud And Cal Fresh Trafficking Anonymously! No One Will Ever Know Who Made The Call.